This eBook is in PDF format. Readable on Kindles and any eBook Reader that supports PDF. For over thirty years I have been a therapist in private practice. I have Doctorate in Clinical Psychology, I am a licensed Marriage and Family Therapist and a Clinical Social Worker. On a personal note, I have been in a successful relationship for over 18 years and genuinely believe that your quality of life and emotional and physical health are all profoundly influenced by the relationship with your partner. We all know that relationships are difficult to sustain and even more difficult to repair when damaged. 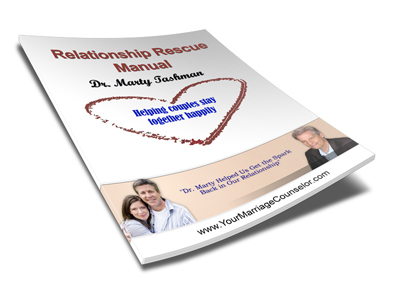 I do believe however, that it is possible to “fix” troubled relationships and I have written the Relationship Rescue Manual to help people save and move their relationships forward. This manual offers a great deal of information and provides exercises that can be very helpful. I have two pieces of good news. (At this point, I’m sure you can use some). 1) You will have tried your hardest and be pleased with what you have done. 2) You will have learned what to do in the future to limit the chances of repeated heartbreak. Remember, you can’t control what someone else does, but you can give this your best effort. You don’t have to do everything right all at once. I know from having done thousands of hours of counseling that often times, the partner who wants to leave the relationship is actually reluctant to do so. They feel desperate and hopeless and believe that their partner will never change. It is often out of desperation that divorce becomes the chosen option. You don’t have to do everything right or follow every suggestion made in the rescue manual, but you do have to do enough so your partner believes that you are sincere about wanting to change things. You have the ability to help make things different. The point here is that you don’t have to be perfect, but convince your partner by your actions that you are moving in the right direction. If you would like more information about the manual please email at drmarty@comcast.net and I’ll be glad to send you a summary of what will be covered. Just email me at drmarty@comcast.net and I’ll be glad to send you a summary of what will be covered.